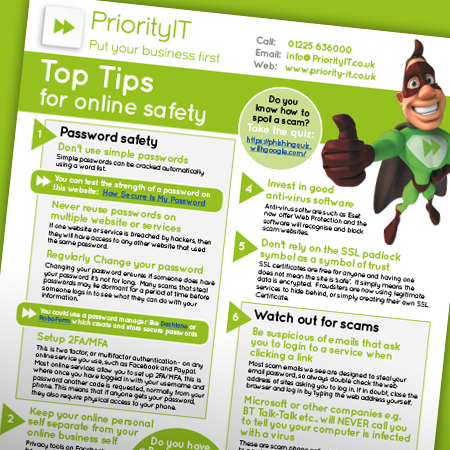 There are awareness days aplenty throughout the year, but one we take on board here at Priority IT is Safer Internet Day. It’s marked each year in February – this year on February 5 – and is designed to increase awareness of the importance of staying safe online. Few of us, if any, can go about our day-to-day work and leisure without being online at some point or other, so it makes sense to stay as safe as possible. This way, we help to protect our businesses, ourselves and our families. The SID campaign’s slogan, ‘Together for a better internet’, is a call to action for all stakeholders to join together and play their part in creating a better internet for everyone, and especially for younger users. And, as a responsible IT support company, that includes the team here at Priority IT. This year, as part of Safer Internet Day, we’re going all out to raise awareness. We’re sending press releases to our local media, and have created a downloadable advice sheet for anyone to access. In the UK, Safer Internet Day runs activities across the country, and takes to social media to raise awareness: in 2018 the collective activity reach 45 per cent of UK children and 30 per cent of parents! Let’s hope that, together, we reach even more people this year. Setup 2FA/MFA – this is two factor, or multifactor authentication – on any online service you use, such as Facebook and Paypal. Most online services allow you to set up 2FA/MFA, this is where once you have logged in with your username and password another code is requested, normally from your phone. This means that if anyone gets your password, they also require physical access to your phone. Don’t use simple passwords. Simple passwords can be cracked automatically using a word list. You can test the strength of a password on this website, How Secure Is My Password. You could also use a password manager such as Dashlane or Roboform, which create and store secure passwords. Never reuse passwords on multiple website or services.If one website or service is breached by hackers, then they will have access to any other website that used the same password. Always be suspicious of emails that ask you to login to a service when clicking a link. Most scam emails we see are designed to steal your email password, so always double check the web address of sites asking you to log in. If in doubt, close the browser and log in by typing the web address yourself. Be careful what you upload to the internet. Once it is there, it is there forever! Certain sites allow you to delete things, but other sites index them so that anything deleted can be uncovered. Microsoft or other companies (such as BT or Talk-Talk) will NEVER call you to tell you your computer is infected with a virus. These are scam phone calls designed to scare you to pay for their services and to steal your personal information. Check if you have been a victim of a data breach. There have been many high profile data breaches which disclosed details such usernames and passwords – TalkTalk, Sony Playstation, LinkedIn and BA among them. Depending on the data breach, your username and passwords may be on the Dark Web. To find out, go to this Experian web page. Regularly change your password. Changing your password ensures if someone does have your password it’s not for long. Many scams that steal passwords may lie dormant for a period of time before someone logs in to see what they can do with your information. Invest in good anti-virus software. Anti-virus software such as Eset now offer Web Protection and the software will recognise and block scam websites. Beware free software and downloads. We have seen many viruses originate from someone downloading and installing a ‘free version’ of software (examples are Microsoft Office or a DVD Converter). Nothing’s free – especially software which can cost hundreds of pounds. The last thing to ask yourself is this: if the worst happens, and you’re hit by a cyber attack, do you have a backup of your critical data? And if you do, has it been tested? Vital data can be lost if you are the victim of a cyber attack, such as CryptoLocker. This threat can be mitigated if you have a good backup. We pride ourselves at Priority IT in particular on our scrupulous attention to our clients’ data, ensuring not only that they are as safe as possible, but that they are also fully backed up. If you’d like to chat to the team about staying safe online, ensuring you have a fully backed up system, or any other IT issue, please get in touch.